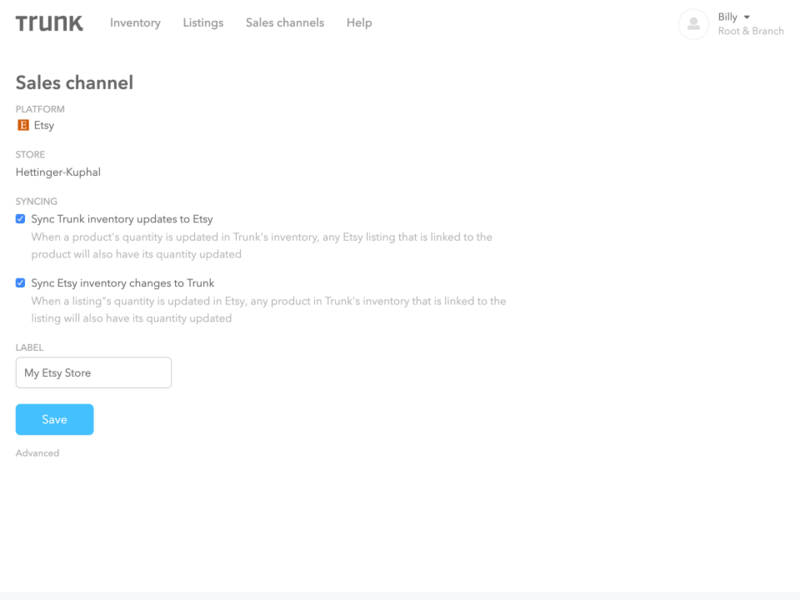 Trunk syncs your inventory in real-time across different sales channels like Shopify, Etsy, Faire, eBay, and Amazon. 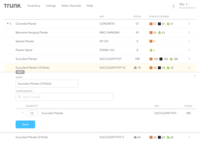 Trunk also gives you powerful centralized inventory features like bundles and kits that sync and adjust like magic. 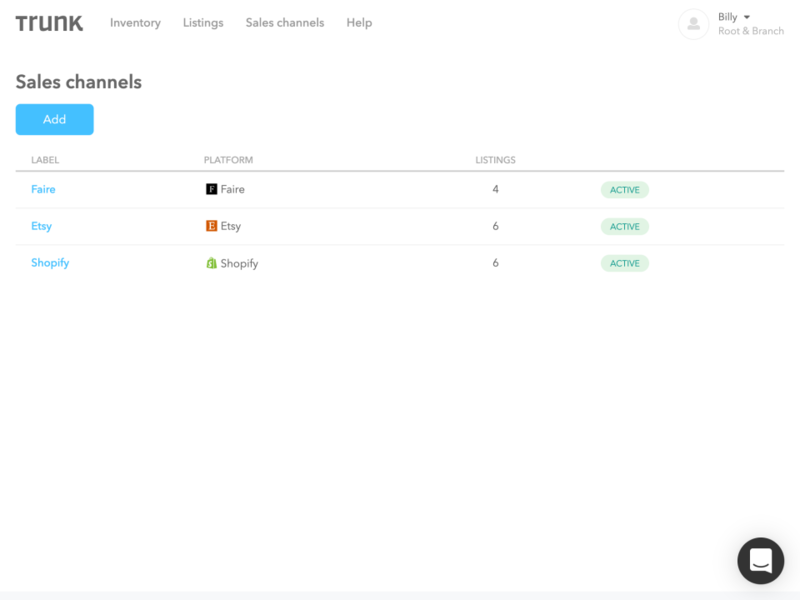 Trunk strives toward the vision of making it easier for businesses to sell on multiple platforms without the overhead and pain. Overall: We sell on Shopify, Amazon, eBay and Walmart and before Trunk our employees had to manually keep the inventory in sync. It was beyond error-prone and was hurting our business since we would experience constant stock outs and oversells. At one point one of our guys was semi-fulltime fixing our inventory. I can't stress how much of a nightmare it was. We found Trunk and integrated it within hours. Then we spent a good amount of time correcting our inventory for hopefully the last time. Ever since then, Trunk has kept our inventory in sync beautifully, even during Black Friday or the busy holiday season. Hope these guys stay in business forever since we'd be seriously messed up without them. 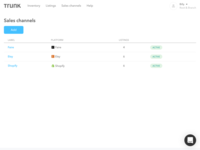 Pros: I love that you can just connect everything and it all links up by sku in just minutes so it's super easy to just get started. I love that the inventory updates are instant. I love that it supports kitting. I love that it's a great value for the price. Overall: It's just worth every single penny. 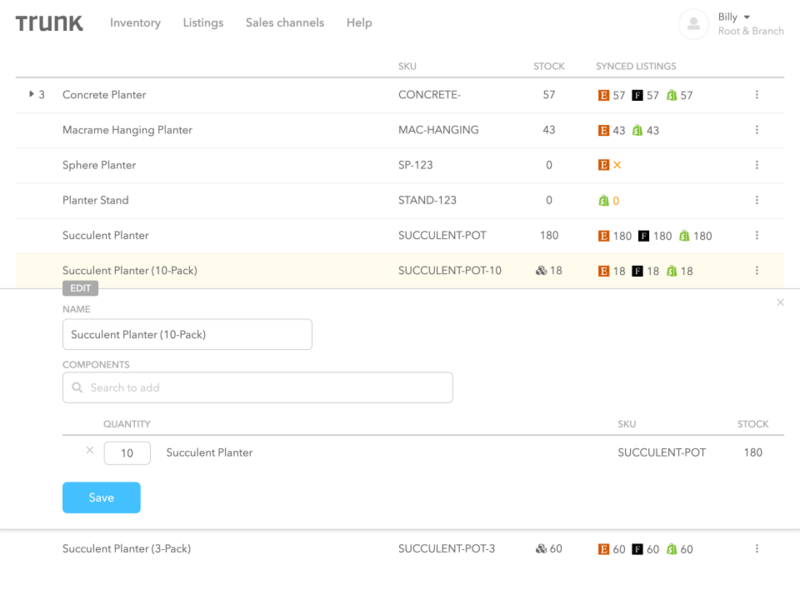 When we were still evaluating we were deciding between Trunk and other inventory control software that was much more complex. We chose to go with Trunk for its simplicity and we just found it worked the best overall. Pros: No frills inventory syncing in real-time!! Properly deactivates and reactivates my Etsy listings when Shopify inventory goes to 0--so so useful since I used to just manually log into the seller platforms and change the number, and this also protects me from accidentally overselling. James, the founder, is super awesome and graciously guided me through everything I needed to get up and running. Cons: Can't think of anything but I know if there are any, they will fix it! Overall: It was hard to find a good inventory sync solution that fit me as a customer because everything out there had a million bells and whistles. I like that Trunk has such a simple and nice interface and does what it claims to do WELL. There's so much software out there that overpromises and underdelivers and I'm happy to say Trunk is not one of those. Pros: I like most about Trunk the ability to manage and sync various parts and assemblies produced with my company Bits into Atoms. It takes the headache out of manually maintaining inventory by spreadsheets. Cons: The one item I wish was included and the least desirable item about Trunk is that there is no list syncing service for managing the syncing of listing across different sales channels. Overall: We have automated the syncing of our inventories and saved tons of time in not having to review spreadsheets and various aspects of parts and assembly management. It's been great! My business helps businesses that sell online integrate software solutions. It's not too often you see a new solution that comes onto the market. 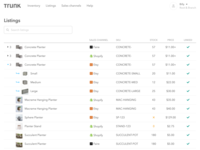 I first began recommending Trunk to one of my clients who needed to sync their inventory. They were extremely happy with it and now I find myself consistently recommending it to others who need to solve this problem because I know it will. Thank you guys for the excellent product! Pros: Keeping inventory in sync was a problem I've had for many years and I'm so glad it's finally been put to rest by Trunk. Now I have more time to spend on my business. Cons: Everything works great although I wish it had a few more features. I know the developer is working on them and I'm confident it'll work great. 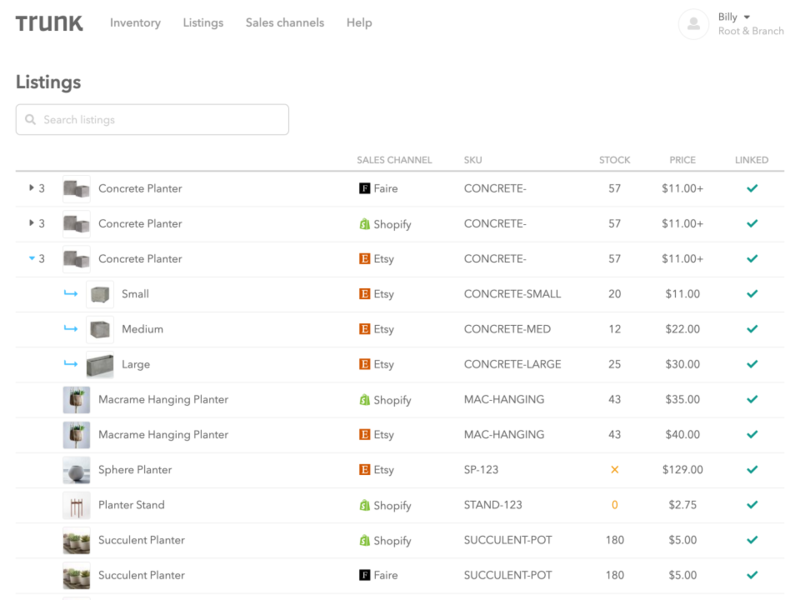 Overall: Trunk is simple and lovely inventory syncing software built by a very responsive and caring developer. I can't sing enough high praises about it.